A move to a new conference was just what the doctor ordered for the Houston Aces. 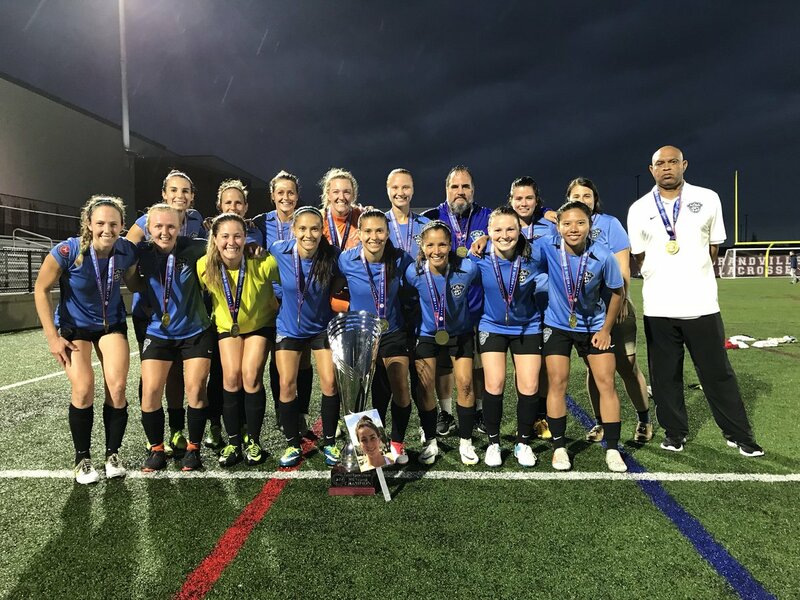 The Aces went 10-0 in the 2018 UWS season in route to their first ever UWS Championship! 2018 UWS Champions Houston Aces. Photo Credit UWS. As a member of the newly formed Southwest Conference, Houston’s victory marks the third different conference representative to lift the league championship trophy (‘16 Santa Clarita-West, ‘17 Grand Rapids-Midwest). The Aces blew through the competition in 2018, outscoring their opponents 56-4 with six of those victories via a shutout. Even with the high firepower the Aces showed throughout the season, Houston needed all of the extra time they could get to put one past East Champion Inferno Rush. Unlike the high scoring semifinal matches (4-3 for Inferno and 3-1 for Houston), the Championship was a defensive battle. Other than an early strike off of the crossbar from Houston’s Gisela Arrieta, most of the first half was a feeling out process for both clubs. The teams ended the first half just as they started, tied at zeros. Arrieta started the second half just as she started the first with a great run and shooting the ball just wide of the net. She continued her impressive offensive run of play with another shot just over the crossbar in the 54th minute. Rush Goalkeeper Kelly O’Brian made a huge save in the 75th minute off of a long shot from Houston’s Allison Murphy. Houston’s Julie Gavorski later provided a carbon copy of Arrieta’s shot in the 78th minute, just going over the crossbar. The constant Aces attack was met by strong defensive play. Led by Center Back Megan Cunningham, the Inferno defense kept the Rush in the game. Inferno Rush did manage to test Houston Goalkeeper Tara MacDonald in the final ten minutes of play. Rush’s Tesa McKibben and Haley Crawford provided the first two shots on net for Inferno, but MacDonald came up strong in net. After 90 minutes of play, the score remained tied at zeros. Houston subbed in their backup goalkeeper Lauren Lovejoy after MacDonald left with an apparent shoulder injury suffered during a Rush corner kick in the 87th minute. Other than the chances in the last ten minutes for the Rush, most of the 90 minutes dominated by Houston. As always, Gisela Arrieta came out firing at the start of extra time. Her shot came off of a strong counter attack in the 92nd minute, but O’Brian came up big again, keeping the score deadlocked at zero. Unlike the rain-soaked semifinals, it looked like the final would be a dry affair, but the sky’s opened up in the 102nd minute. The pace of play slowed down as a result of the bad weather and after the first fifteen minutes of extra time, the match remained scoreless. The best chance since the opening minutes of the game came in the 112th minute, when Rush’s McKibben made a charging center run down the field only to be denied by Houston’s Lovejoy with a great save directing the ball over the net. 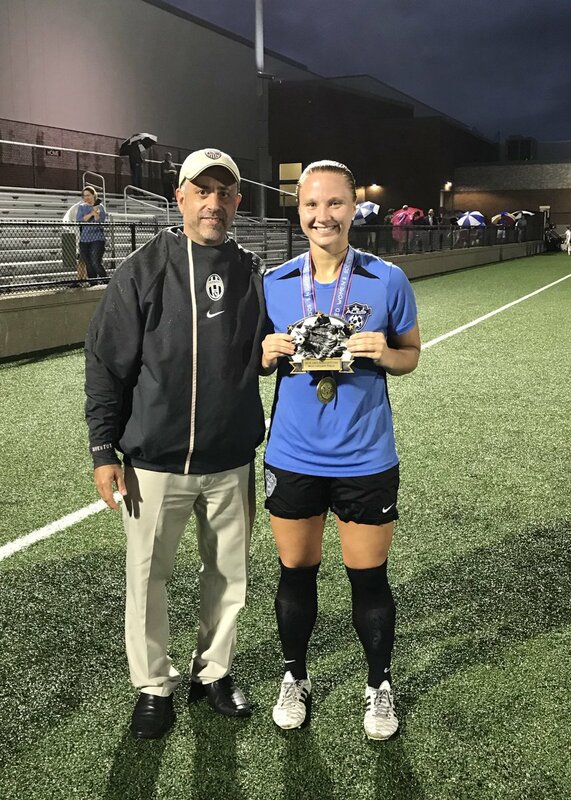 Gavorski’s late goal also led to her receiving the Finals MVP award. Photo Credit UWS. The tie was finally broken in the 118th minute by Houston’s Gavorski off of a centered pass from Tatiana Ariza. Gavorski was able to generate enough power to slide the ball past O’Brian on the near post to give the Aces the lead. The late goal gave Inferno Rush no time to generate a rebuttal and Houston took home the 2018 UWS Championship!